and endotracheal tubes in children with upper respiratory infections. management techniques for anesthesia providers to follow. html. Accessed February 25, 2012.
respiratory infection in small children. Anesth Analg. respiratory tract infection: still a dilemma? Anesth Analg. of adverse respiratory events. Internet J of Anesthesiol. hracd2573&version=1.0. Accessed February 25, 2012.
in children with recent upper respiratory tract infections. from anesthesia: a logistic regression. Pediatric Anesth. tract infections. Paediatric Anaesth. 2001;11(1):29-40.
cause and effect [Editorial]. Anesth. 2008;108(6):1154.
when a child has an upper respiratory infection? 13 Pennant JH, White PF. The laryngeal mask airway. Anesth. 14 The Joanna Briggs Institute. Levels of evidence FAME. 15 Höhne C, Haack M, Machotta A, Kaisers U.
GRELSON, SRNA, Megan. Risk of Complications Using Laryngeal Mask Airway versus Endotracheal Tube During General Anesthesia in Pediatric Patients with Upper Respiratory Infections: A Narrative Review. Creation of the Upper Respiratory Infection Screening Tool© and Management Al. 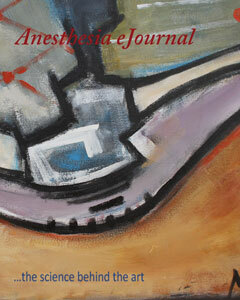 Anesthesia eJournal, [S.l. ], v. 1, n. 1, jan. 2013. ISSN 2333-2611. Available at: <https://anesthesiaejournal.com/index.php/aej/article/view/13>. Date accessed: 23 apr. 2019.